It's safe to say Paddy McNair hasn't exactly had the season he envisaged when he joined Middlesbrough. A £5million signing from Sunderland in the summer, there was much expected from the Northern Irish international after a stellar end to the 2017/18 season at the Stadium of Light. 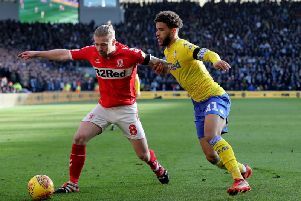 But he has failed to impress on Teesside and, having found himself on the fringes of Tony Pulis' squad, the versatile midfielder has now seen his woes continue of international duty. While his club chances have been limited, McNair remains a regular fixture in Michael O'Neill's Northern Ireland squad. And he was handed another international cap during the GAWA's trip to Estonia - but it's likely the Boro man will want to quickly erase this game from his memory. As shown in the clip above, McNair spurred a fine opportunity to open the scoring as he somehow missed from five yards out with the goal at his mercy. He'll be keen to bounce back when the side face Belarus on Sunday.